In a puppy parody of Kanye West’s iconic ‘Famous’ video, ten of Instagram’s best loved hounds feature in a new video to support (RED)'s fight against AIDS. The ten ‘Instagram-Famous’ pups including TunaMeltsMyHeart, ToastMeetsWorld, MuppetsRevenge, Chloe TheMiniFrenchie, Reese, ChloeKardoggian, KingBentleyTheBulldog, MervinTheChihuahua, MochiAnd TheCity and EllaBeanTheDog joined together for a day, in bed, to celebrate the launch of the limited edition (BEDHEAD)RED dog pajamas, in support of (RED)’s fight against AIDS. Sporting colorful red and while dog pajamas designed by Bedhead founder Renee Claire Bertrand, the dogs brought their talent and tails to help raise money for The Global Fund – the recipient of all money raised by (RED). 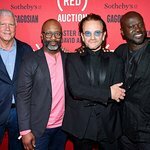 To date, (RED) has raised more than $360 million to fight AIDS, and impacted the lives of more than 70 million people with prevention, treatment, counseling, testing and care services through Global Fund grants that (RED) money supports. However, everyday 400 babies are born with HIV, and (RED)’s goal is to help get that number to near zero by 2020. The pajamas which come in sizes from Small to Extra Large cost $28 and are available at RED.org until Dec 31st; as part of more than 200 products which are all raising money for (SHOPATHON)RED. To support the fight, BedHead will donate enough money to provide 50,000 days of life-saving HIV medication in sub-Saharan Africa. For further information or to buy the limited edition (PRODUCT)RED collection puppy pajamas visit: www.RED.org or www.bedheadpjs.com/red.